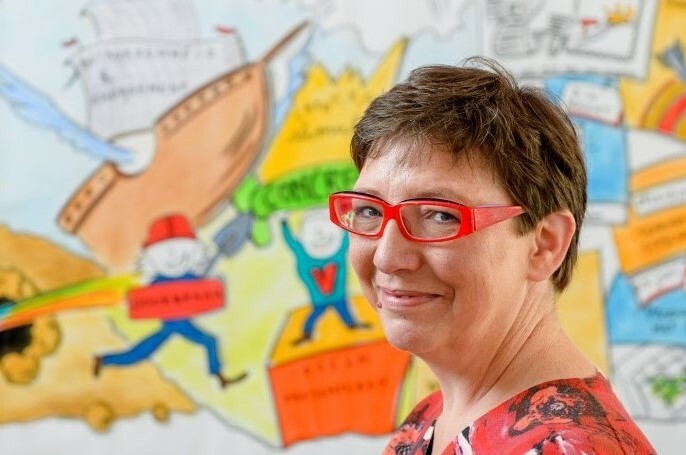 When Martine founded her own company, Visual Harvesting, in 2009, she was able to submit a proven track record in communications, marketing and quality management. Thanks to that professional experience she got thoroughly acquainted with organizational, corporate and business operation fields, which served her well to combine her insights and creative talent, her ability to quickly and accurately analyze, conceptualize, make notes and visualize. 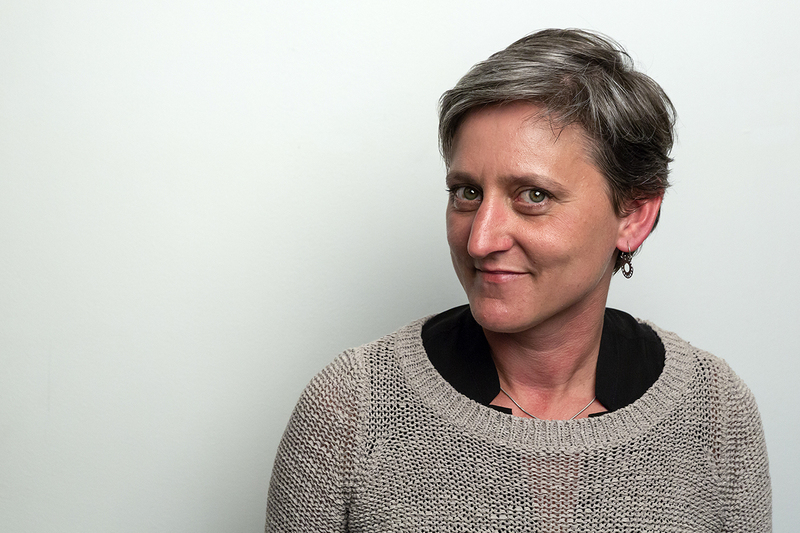 Martine is a successful facilitator and a passionate, motivated, enthusiastic worker bee coach eagerly sharing her know-how, as well as a powerful, supportive and competent sparring partner to her colleagues. She’s a driven entrepreneur, non-conformist and curious by nature, continuously looking for opportunities to aspire growth for her and her colleagues in whatever challenge they face. Martine is surrounded by a thriving team of Visual Harvesters, each and every one of them adding their strong points and talents to the group. She’s ambitious to find the perfect match for every assignment and every client, so as to create the biggest added value possible. We dare to say Axelle has gone off the rails. She started her career as a social nurse to surprisingly end up being a strategic illustrator. She listens, contributes to the thinking process and then visualizes your corporate strategy in a picture that is meant to engage, inspire, focus and initiate interaction. 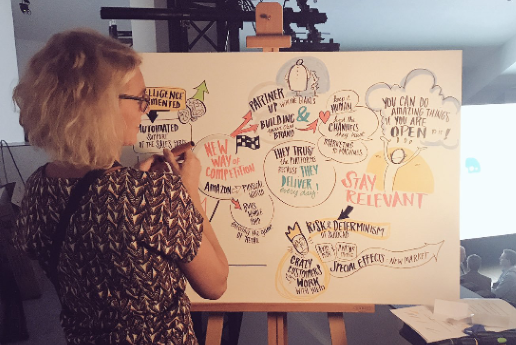 “The more challenging, the more exciting” is the credo by which Axelle translates company stories and strategies into pictures that guarantee instant clarification. It’s her mission to empower drawings so they can support organizations in their efforts to successfully run and innovate their businesses. But there’s so much more than just drawing. Her experience in strategies, HR and communications enable Axelle to constructively join creative thinking processes in search of the best method to produce the best results. 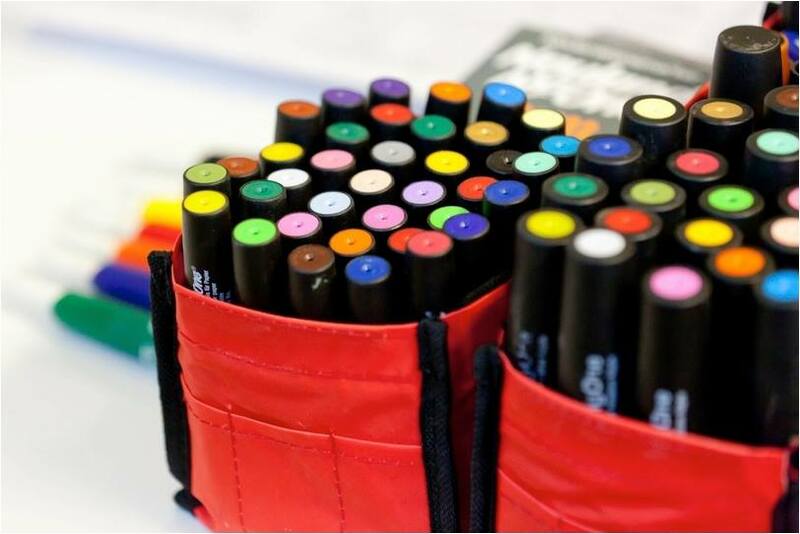 Even if it means that drawings are not essential to the outcome. As a kid Kristof wanted to be a cartoonist, but somewhere along the way he ended up in the technology industry, where he spent 20 years of his life. One day he came across a team of people who helped clients solve strategic problems by drawing on walls. 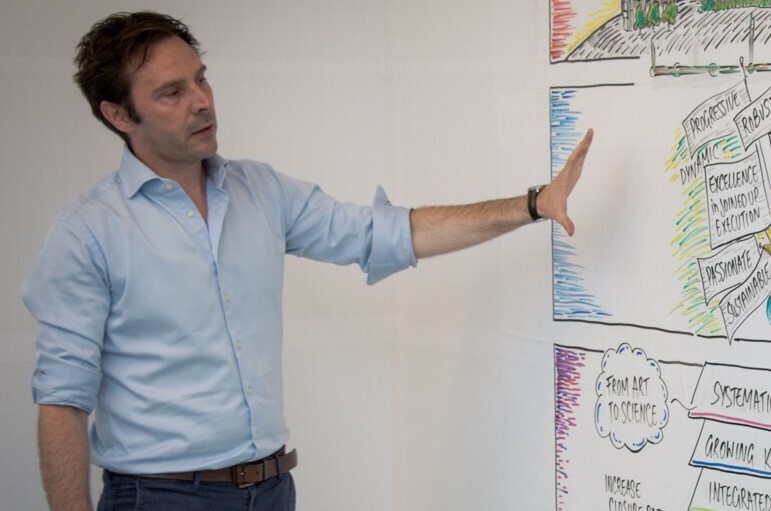 Kristof decided to join that team and as such he developed his graphic facilitation skills. 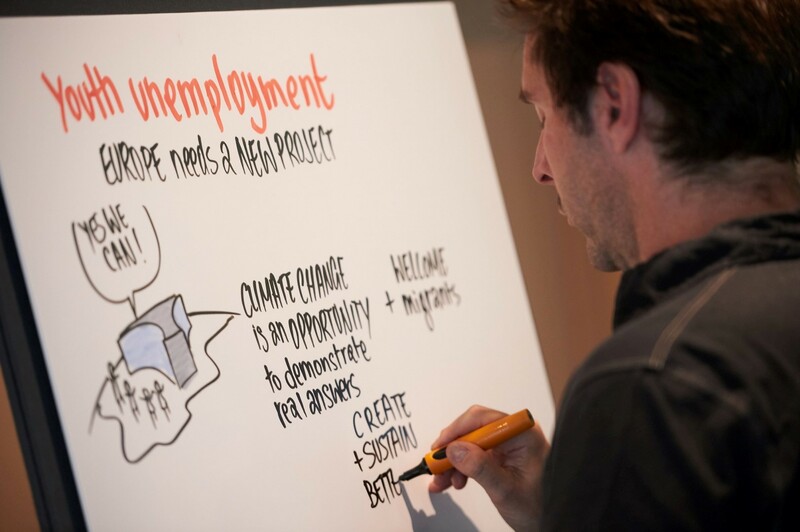 Kristof is an in Silicon Valley trained visual facilitator with 20 years experience in technology and business transformation. 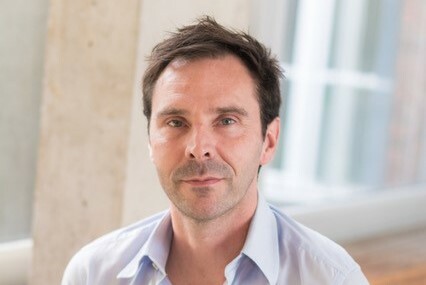 He facilitated many company leaders and decision makers, creating visions and shaping digitalisation strategies, quite often around digitalisation, innovation and culture change. Iris spent her youth unleashing creativity at the drawing table. Her focus on drawing intensified as she studied at the Royal Atheneum of Fine Arts and later, as she completed an MBA in Graphic Design. Iris went on to work in NGOs, trying to find the most effective ways to change mindsets and behaviours for the better. In her work as a communications coordinator for Greenpeace International she became fascinated by the power of storytelling in creating emotive campaigns and how illustrations can bring those stories to life. 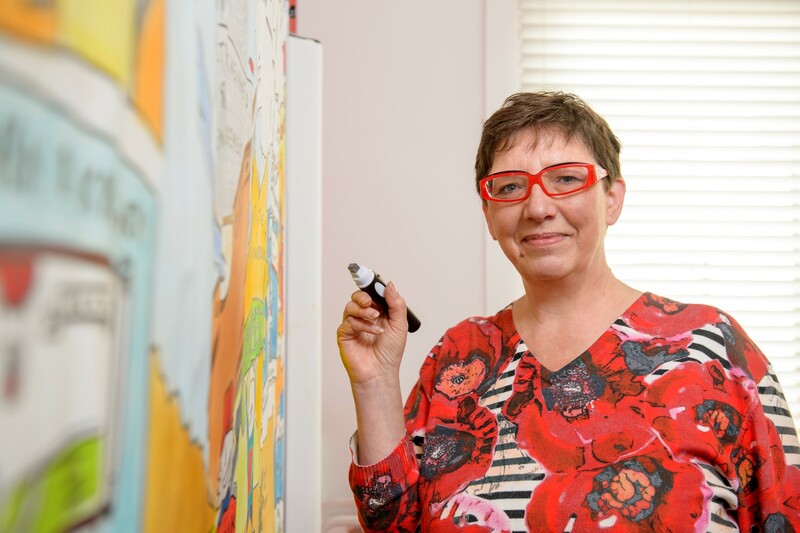 She continues to work for a wide range of causes in a variety of styles both digitally and at the drawing board. Jolijn is Management Assistant at Visual Harvesting. She will gladly help you if you have questions about the availability of our graphic recorders, about price offers, our accounting, if you want to know more about the practical issues or if you have other questions. So it is very likely that you will get Jolijn on the phone or a mail from her in your mailbox if you contact us. 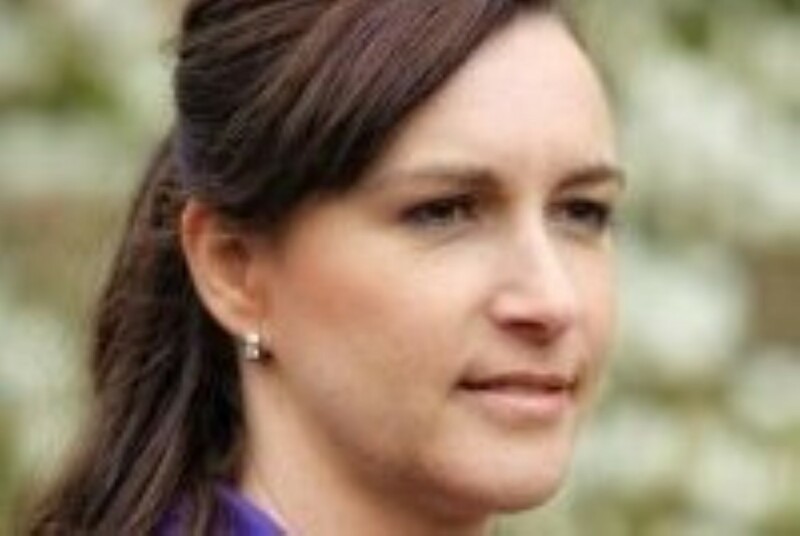 Jolijn has extensive experience in all-round administration & office management. She worked as a director and production assistant for the belgian television station Één and then gained more than 15 years of experience as a project organizer and office manager for various organizations. Elke is also Management Assistant at Visual Harvesting. She is the go-between for our bookkeeping, billing and all kinds of general administration. 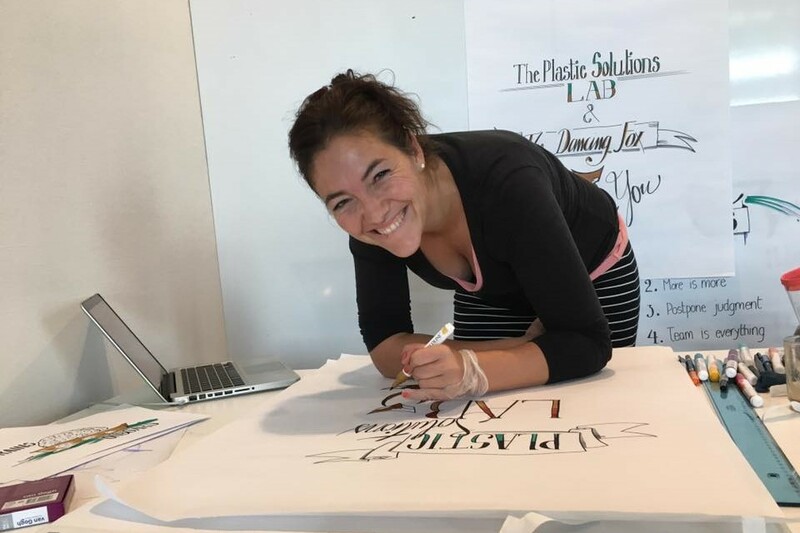 If you register for one of our workshops, then it is Elke who helps you with all the practical information and if you have any questions about the “KMO-portefeuille” then she is the woman you can turn to. Elke has years of experience in office management. She formerly worked for years in a multinational company as Executive Assistant. Renatta is our partner in the United States. 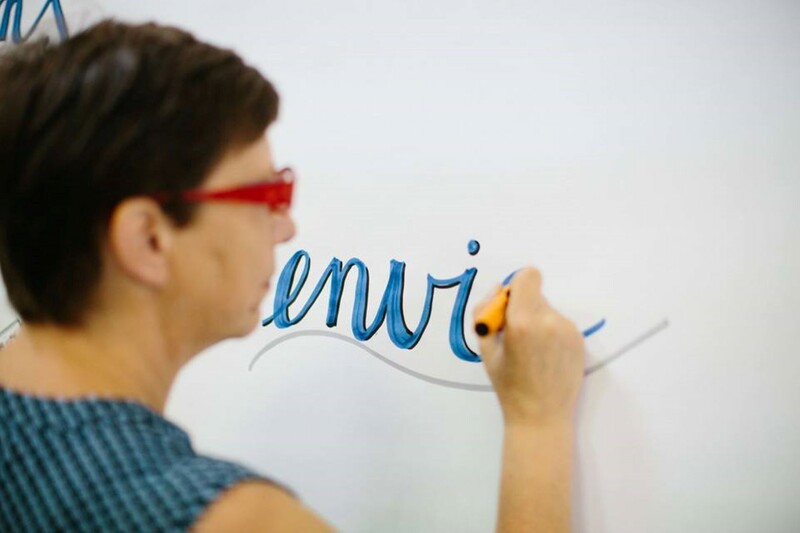 For 15 years Renatta has been recording live and virtual meetings for executives and their teams, creating visuals out of their conversations, and decisions in large and small events, facilitating Idea Walls and delivering Graphic Recording trainings. 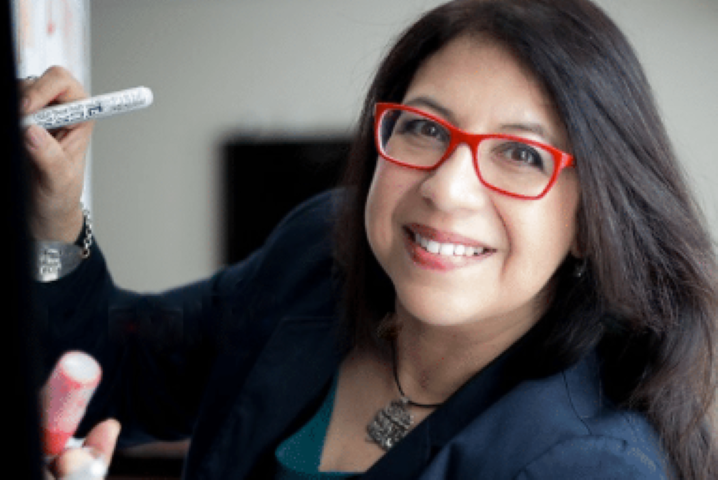 With fluency in English, Spanish and Portuguese, she is often called upon to do simultaneous, live recordings of international, multi-cultural events for many of the largest institutions across industries and all over the world. 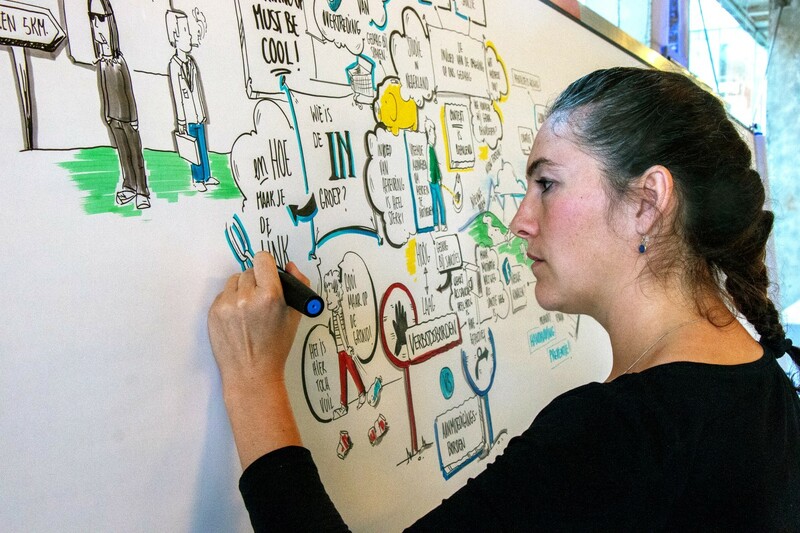 Based in Atlanta, GA – USA and willing to travel Renatta is an entrepreneur, a businessperson, former HR manager, visual artist, a trainer and since 2014 a Board Member of the IFVP-International Forum of Visual Practitioners. We communicate in 3 languages: Dutch, English and French, which allows us to also facilitate multilingual teams. 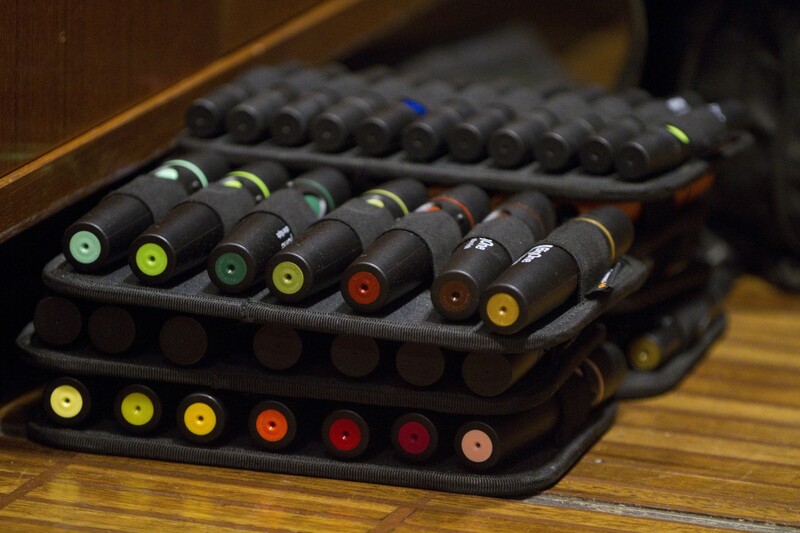 Our tool kit consists of no less than 112 markers that come in different sizes. The smallest size of paper we have already worked with is 0,05m², the largest 50m² in a single session. We make our visualizations on hard (paper) or soft (digital) copy.